It isn’t unusual for twins, triplets or more to be born preterm (i.e. before their due date) and having to spend days, weeks or even months in the Neonatal Intensive Care Unit (NICU) as a result. For those families wishing to breastfeed, it is possible to do so by pumping and bringing in breast milk to the NICU to be fed to their babies. To ensure the best quality milk for your babies, here are some recommended collecting and storage guidelines of breast milk. Remember that every drop counts and whatever is collected is the best thing for your infants. If you have any questions regarding your milk supply or how to conserve it, be sure to ask the NICU staff. Purchase some bottles and labels to store the milk. The bottles need to be boiled and sterilized before each use. Bags are not appropriate for storing milk in the NICU. Clearly label each bottle, including the babies’ names, date and time that the breast milk was collected. Ideally prepare bottles of 1 ounce, 2 ounces or 4 ounces, if you can, for storage. Do not overfill the bottles as breast milk expends when it is frozen. Make sure all pump material is properly cleaned and sterilized between uses. Fresh breast milk can be refrigerated and transported to the NICU on ice or “blue ice” packs in a little insulated cooler. Once at the NICU, give your labelled breast milk to the nurse in charge of your babies to be placed in the refrigerator or freezer. If you have any questions regarding these procedures or about breast feeding in general, be sure and talk to the nurse in charge of your babies. Hospital staff will be most happy to answer your questions and help you at any point. If you have any questions regarding pumping or storing your breast milk, do not hesitate to discuss them with the nurse or lactation consultant. Your breast milk is important to your babies. Save ALL the milk that you pump. From Valerie Lavigne, Mom of three breastfed babies, including twins. Reviewed by Erin Shaheen, Child Birth Educator, Mom of 4 breast fed babies, including twins. The Crying Baby: What is Baby Trying to Tell Us? A baby’s main means of communication in the early weeks and months of life is to cry. It doesn’t take too long for parents to note that not all of their baby’s cries sound the same. Some are easily recognizable, e.g. hunger, anger and others which may not be so easy to “translate.” As your multiples are individuals, it may be that one or more will not go through the same reactions at the same time. All babies cry, even healthy ones receiving excellent care. By crying, babies can express their pain, hunger, anger, fear and boredom, but sometimes they will cry for no specific reason. 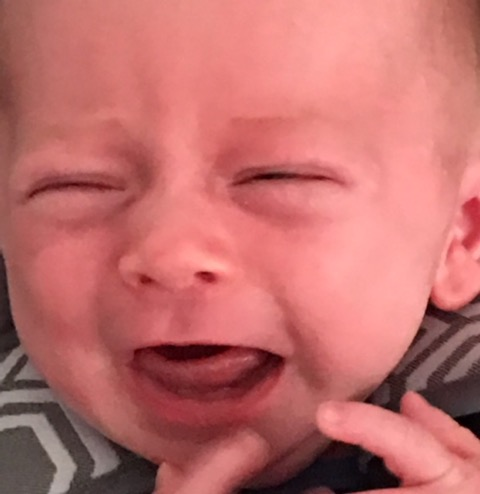 By approximately 3 months of age, crying usually drops off as babies find other ways of communicating, e.g. babbling or cooing, and spend more time exploring their environment. Continued crying can be anxiety provoking for parents and make parents feel worried, upset, incompetent and overwhelmed about their ability to meet their babies’ needs. A colicky baby might cry for 3 hours a day, at least 3 days a week, for 3 weeks in a row. 5) The baby/babies seem to be suffering. *Adapted from a brochure by Centres of Excellence for Early Childhood Development, Crying: Listen, they’re talking to you! Situation: Pay attention to your child’s crying and listen if you can identify any differences between what you are hearing. If an infant is hungry, for example, the crying will sound quite different from when s/he is angry or fearful. Response: Respond quickly and calmly to the child and hold them close to your body as often as possible to see if the crying calms down. Situation: If you find yourself provoked by and anxious due to inconsolable crying. Response: If you become upset, overwhelmed or frustrated with the incessant crying, pull back for a few moments. Put your child in his/her crib, leave the room, take a deep breath and return a few minutes later when you are calmed down. If you are unable to calm yourself down, ask someone else to take over. 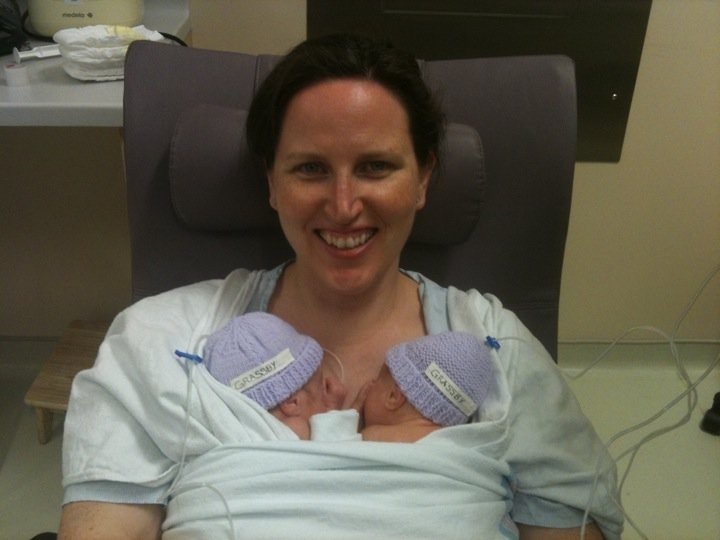 Babies will often respond positively to Kangaroo care** or being swaddled. Trying either or both techniques may help calm a crying baby. Letting a baby cry through the event on his/her own is not a good idea. Picking up a crying baby as early and calmly as possible for cuddling can prevent things from escalating. Humming or shushhhing gently into baby’s ear may help him/her calm down. If you are feeling particularly overwhelmed, bundle babies into their carriage and walk around the block or go to the park. Talking to other parents can be helpful for you and fresh air and a changed environment with new interactions, will often settle babies. If your baby or babies continue to cry excessively for no apparent reason and do not respond to cuddling, Kangaroo care or swaddling, make an appointment with their doctor to ensure that the babies are healthy and there is not some underlying reason for their feelings. **Kangaroo Care: Baby or babies are placed naked, except for diaper, onto Mom or Dad’s bare chest and securely/warmly wrapped onto the chest. Babies are generally calmed by hearing parent’s heartbeat, as well as the warmth and feeling of security with the closeness. The position simulates being in the womb and can be soothing for them. Kangaroo care has become increasingly popular for newborn infants, especially preterm or low birth weight, whereby an infant is held skin-to-skin against the chest of an adult, usually the parents. Ideally kangaroo care will begin right after birth and continue for as long as is possible, although short periods of time are also beneficial to babies and parents. Mom and/or Dad/partner are usually wearing an over-sized shirt, large hospital gown or loose clothing exposing their chest. 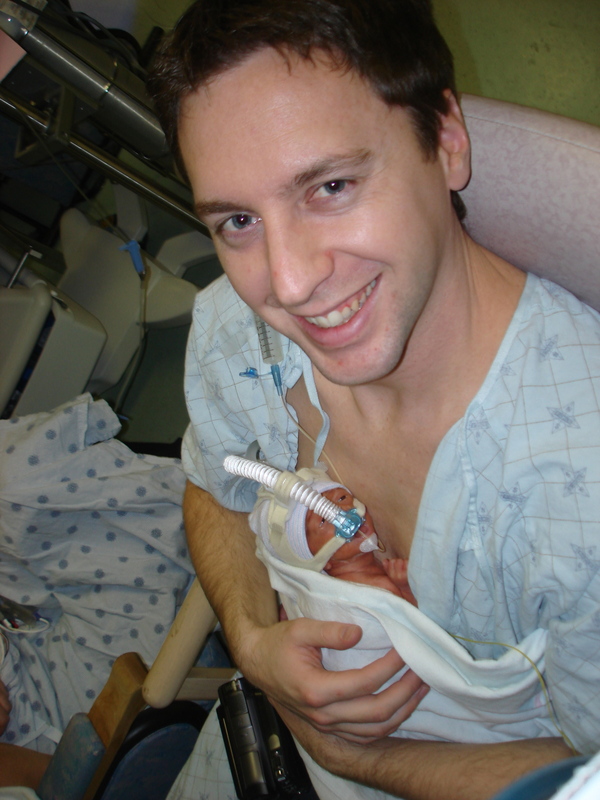 The nearly naked (diaper only) infant is placed directly on mother/father’s exposed chest and the shirt wrapped snugly around baby, drawing him into the parent’s chest where he settles and snuggles. Instead of a shirt, a warm blanket can be used to cover the infant(s) on parent’s chest to draw her close. Two babies, and sometimes more, can be held at the same time on a parent’s chest with support from a nurse or the other parent. If there are tubes and wires on a baby, be sure and check with the nursing staff before going ahead with kangaroo care. It is also good for the babies to be together. Every hospital has its own policy regarding Kangaroo Care, so check with your hospital to find out what their policy is. Two of my triplets (they are aged 8 weeks) have flat spots on one side of their heads. How did this happen? What can we do about it? While the rate of Sudden Infant Death Syndrome (SIDS) has greatly decreased since parents and caregivers have followed recommendations to put babies to sleep on their backs (“Back to Sleep” programme), another issue has come to the fore. Babies who lie for long periods of time in one position, can develop flat areas on their heads. It is well known that babies skull bones are very soft until about one year of age. Further, multiple birth babies can be at a greater risk for occipital plagiocephaly (and/or torticollis) due to “stacking” in the womb, i.e. the lower baby may be engaged in the birth canal with one, two or more babies above it. The combination of increased pressure from above that lower baby combined with gravity, can place a lot of pressure on the lower baby’s head and neck. In addition, prematurity and supine sleeping (i.e. placing a baby on its back to sleep) increase the liklihood of there being a risk of a flat spot occurring on the baby’s skull. What is Occipital Plagiocephaly of Positional Orgin? “Occipital Plagiocephaly” is a medical term for the flattening of one side of the back of the head, often caused by lying with the head in the same position. A flat area may develop very quickly or over several months. Visually, your child may have one ear that is shifted forward of the other and may also have facial changes, e.g. forehead protrusion or cheek protrusion in more severe cases, on the flat side of the head. What can I do if my baby(ies) has a flat area on her head? With proper positioning encouraged by the parents, the baby’s head shape usually quickly improves on its own. When a flattening of the head is noted, or you notice that your baby(ies) has a strong preference for always turning to the same side, it is important to take some action to rectify the situation. Make sure that your baby(ies) is placed off of the flat area at all times. This can be accomplished by placing a small, rolled up blanket under your baby’s shoulder, on the same side as the flat area. This will help keep the baby’s head turned away from the flat side. Make sure that the baby’s underside arm is out so that there is extra protection against the baby accidentally rolling on its tummy. Babies tend to look towards the door while lying in their cribs (as they wait for a parent to appear). Move the crib often to change the view of the door. Move toys and mobiles around and away from the flat side of his head. This will encourage your baby(ies) to look towards the toys. You could also regularly change the ends of the bed when putting your baby(ies) to sleep. When holding, feeding or carrying your baby(ies), make sure that there is no undue pressure placed on the flat side. With the new style of baby seats that go from table to car to stroller frame, your baby(ies) can potentially end up spending long periods of time sitting in the same position thereby increasing the chances of a flat spot developing. Be aware of this danger and avoid long periods where your babies may remain sitting in the same position. Provide your baby(ies) with lots of SUPERVISED play on their tummies. This helps build and strengthen neck, shoulder and arm muscles. Appropriate toys can be used to encourage tummy and side lying play. Provide lots of SUPERVISED time to play in a sitting position and in an ‘exersaucer’ as soon as each baby has achieved good head control. Pay attention to bottle-feeding. It isn’t necessary to change a baby from side to side once the spot has been noticed, but the person feeding the baby(ies) will need to make sure that there is no undue pressure placed on the flat spot. For prevention of a flat spot occurring, change your baby(ies) from side to side at each feeding. If you notice that one or more of your babies has difficulty turning her head(s), she may require some neck stretching exercises. Consult your physician who can refer you to appropriate physiotherapists, if this is the case. For the best results, positional therapy needs to be started before the baby(ies) is four months old. How do flat areas occur? One or more of your multiple birth babies may be born with flat areas on their heads due to lack of space to change positions in the womb. One multiple birth baby may be engaged in the birth canal while the other(s) is “stacked” on top, putting pressure (gravity) on the lower baby’s head and neck. As newborn skulls are very soft and malleable to help ease the baby through the birth canal, it is not unusual for newborn babies to have an unusual shape to their heads, due to the pressure of birth. This will generally rectify itself by about six weeks after birth. However, some babies show a preference for sleeping or sitting with their head turned in the same position for the majority of time. Some babies may have the additional problem of torticollis, a neck muscle problem, that prohibits them from properly turning their head to another position. Premature babies have softer skull bones. Does having Positional Plagiocephaly cause problems for my child? In the majority of cases, having a flattened area will not affect a baby’s brain growth or mental development. When the hair grows in, it will cover the flat spot and it will not be visible. However, if there are visual changes in the baby’s appearance, i.e. one ear may be shifted forward of the other one, on the same side as the flattening, this can make a difference cosmetically with perhaps reduced perceived attractiveness and there is a potential for teasing and/or rejection amongst peers. What do we do if positioning doesn’t help? If positioning exercises do not help, it may be necessary for your child(ren) to wear a helmet(s). Your physician will guide you, if this is the case. Each case is different and each child unique but you may count on your child(ren) needing to wear a helmet for six to eight months from when it is initially recommended. It is possible that more than one of your multiples may show signs of occipital plagiocephaly. Only in the more severe cases will the use of a helmet be indicated. Occipital Plagiocephaly: a one-sided occipital flattening that results in marked skull asymmetry. Torticollis: shortening of the neck muscles on one side of the neck, making it difficult to turn the head. Rectified by stretching exercises. Uterine Constraint; Uterine Packing; Stacking: All of these terms may be used to describe the positioning of multiple fetuses within utero. I have chosen to use ‘stacking’ in this text. Najarian, S.(1999). Infant Cranial Molding Deformation and Sleep Position: Implications for Primary Care. Journal of Pediatric Health Care, 13, 4, 173-177. Neufeld, S. and Birkett, S. (1999). 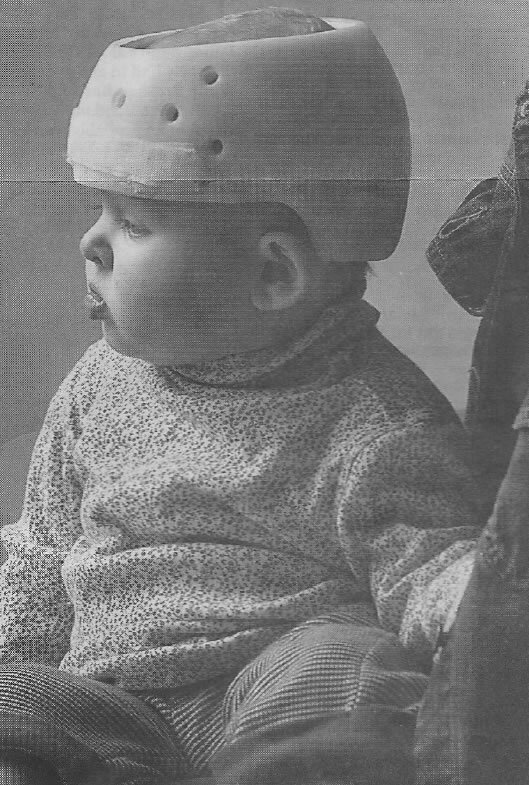 Positional plagiocephaly: A community approach to prevention and treatment. Alberta RN, 55, 1, 15-16. With guidance and input from Karen Dube, Nurse Practioner/APN, Ottawa, Ontario.